What I need is performance, eye candy is optional. My primary desktop environment is Xfce, as it is more lightweight than GNOME, KDE, or Cinnamon (Mate is out of my choice), yet it has more goodies (plugins) than LXDE. But due to my 4-year-old laptop, I found that LXDE has better performance than Xfce significantly. I can run multiple heavy applications at the same time, especially Firefox and Chromium. Xfce performance drops when I run both applications simultaneously. Switching between applications is slower. If running with Skype at the same time, and doing some development testing, the performance drops drastically. LXDE is even more lightweight than Xfce. That is why I used LXDE. The only drawback of LXDE is that it does not allow me to zoom the screen with Alt+Mouse Scroll. This is a crucial feature I need as a lecturer. In order to gain a better speed, I also have to sacrifice the wallpaper auto changing as in Xfce. Furthermore, configuring the LXDE is a little troublesome. Since LXDE is using Openbox as window manager, a lot of configurations depend on the Openbox. To configure the LXDE Openbox, we can use the obconf to configure. It is actually editing the ~/.config/openbox/lxde-rc.xml. obconf also works on Openbox (window manager only). The corresponding file is ~/.config/openbox/rc.xml. LXDE hotkeys are depending on the Openbox too. We can use the obkey to configure the hotkeys. It is also editing the ~/.config/openbox/lxde-rc.xml or rc.xml. LXDE has its own panel (lxpanel). It allows to show (mostly) all the applications in the menu. However, if we right-click Openbox desktop area, the context menu does not show the installed applications. The application menu in the Openbox is actually written in the ~/.config/openbox/menu.xml. The skeleton file contains the hard coded applications. menu.xml is also used by Openbox without running the LXDE. That means, if a user login with Openbox window manager instead of LXDE, it will use the same menu.xml. However, this can be changed by editing the lxde-rc.xml (LXDE) or rc.xml (Openbox window manager only) to load specific menu XML file. As a result, we are allowed to have different menu.xml files, one for LXDE and one for Openbox (window manager only). Autostart is quite complicated. If using LXDE, Xfce, or Openbox, the application desktop files in the ~/.config/autostart will be launched once login. They can also be disabled. However, LXDE also allows autostart through ~/.config/lxsession/LXDE/autostart, where the LXDE is the default profile name. The autostart file is not exactly a shell script, but we can add the commands in this autostart file. Though LXDE is based on Openbox, it does not use ~/.config/openbox/autostart file. If we login with Openbox window manager only, then ~/.config/openbox/autostart will be sourced (called) instead. This autostart file is just a shell script. As a result, we can use control structure like if-else. In order to run a batch of commands immediately, we can use the “&” to run the commands in the background. Since Openbox is just a window manager, if we login with Openbox window manager only, there is no panel, wallpaper, volume control, etc. Therefore, we have to install the packages by our own. Besides that, Openbox does not handle graphical logout. However, we can install oblogout and add it to the Openbox menu. I personally use the tint2 as the panel, feh for the wallpaper for both Openbox and LxDE (since I don’t use PCManFM), volumeicon for controlling the volume, compton to composite the window, and xscreensaver for screen saver. tint2 has the battery indicator and date time indicator. So, this is how my Openbox look. As using Arch Linux, the advantage is I can choose any Desktop Environment or any Window Manager. Recently, I have tried several Desktop Environments and Window Managers which are officially supported in Arch Linux. After trying, I learnt the differences and similarities among these Desktop Environments and Window Managers. My primary Desktop Environment is Xfce4. Previously was GNOME 2. Since the release of GNOME 3, I chose Xfce4 as it is more conventional and there a lot of useful goodies (plugins). It is also lighter than GNOME. 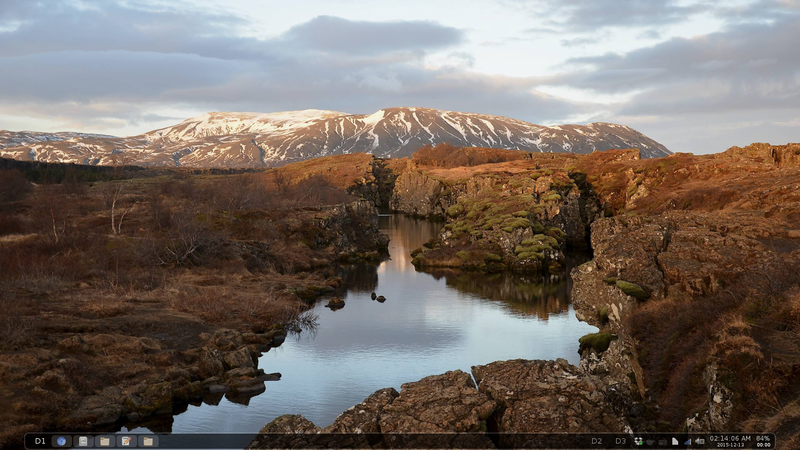 LXDE is similar to Xfce4 in the sense of lightness, and it is even lighter. It uses OpenBox (a window manager). The drawback of LXDE is it has less plugins and lack of GUI configuration tool for modifying shortcut key. However, this can be solved by installing obkey. In my opinion, GNOME3 is just an eye candy. It is nice to demonstrate the visual effects to the users. Because of the window and workspace are quite different, old conventional user like me feels uneasy to use it. Furthermore, there is no way to move the GNOME Dash (left panel). Yet, there are some ways to modify it. Extra configuration of GNOME requires GNOME Tweak Tool. MATE and Cinnamon are just similar to GNOME2. LXQt is just similar to LXDE. Enlightenment is another DE. It is quite different from others. It does not use Qt or GTK+, but uses EFL (Enlightenment Foundation Libraries). It has good visual effects. However, a critical problem I faced is the system tray. The system tray uses systray module in Enlightenment. However, the systray does not work properly and seems very buggy. Even worse, the systray is not going to be maintained by the developers. Therefore, alternative such as trayer can be used. There are a lot of Window Managers as well. There are three categories: stacking, tiling, and dynamic. Stacking window manager is just like Windows, Mac OS X, or any other common Linux distro. The window can cover or on top of another window. Tiling window manager is not common. The windows are all in the same level, that means they are arranged as tile. Dynamic window manager allows user to switch between tiling or stacking or mixed. All the DEs mentioned above are consider stacking. Though we can arrange our windows as tiling in stacking window manager, the design of the window manager itself is still based on stacking. I tried several window managers. There are some I do not like, especially tiling window managers, because they are almost similar. I tried Window Maker and IceWM, they are impressive, but not my favour. As LXDE uses OpenBox, we can login with OpenBox without LXDE as a pure window manager. It is interesting to learn that a window manager does not necessary provide any panel (taskbar). The advantage of OpenBox is that you can choose your own panels, such as tint2 or Cairo-Dock. You can just use whatever you like, even Xfce4 panel or LXDE panel. I tried fluxbox awhile only. It is also a stacking window. But it provides a panel. As a result, we need not to choose our own panel. A very simple ready to use window manager. OpenBox requires customization before truly using it. The last one I would like to mention is i3. It is a dynamic window manager. A Linux lover should try it. It requires a little time to learn the tiling concept and the hotkeys. Once you know how does it work, you will like it. i3 can be switched to tab mode or tile mode. Furthermore, the windows can be changed to floating windows. Floating window is similar to stacking window, but it is always on top of the tiling window. So, the software such as Pidgin can be set to floating window. Besides that, Pidgin can hide to tray. Sorry, i3 does not have any minimize or maximize. Hide to tray icon is the only solution. After trying these DEs and WMs, whatever I choose, I will prefer several features. Firstly, hotkeys are important. It should allow me to customize the hotkeys. Panel is important to show the running applications, and system tray is very important to avoid using too much space for the running applications. Showing date, battery status, network connection, and volume control is very important. These show and control the computer status. Workspace (or virtual desktop or pager) is very important. Launcher is important, such as gmrun or GNOME Do. Using a launcher, we can run any application by typing the command. It is different from running a program from terminal emulator. When running a program from terminal emulator, the program is a child process of the terminal emulator. Exiting terminal emulator will also terminate the child processes. Less important components are application menu, startup applications, terminal emulator, file browser, task manager, screensaver or screen lock, notification, and screenshot. Similar to launcher, we can launch the application from the menu. Sometimes I just cannot remember an application name, searching from the menu does help. Startup applications can always be configured, either using DE’s configuration tool, or using .xprofile. There are a lot of terminal emulators. Just install one and bind it with a hotkey, it will be very useful to open a terminal emulator anytime. Similarly, file browser is useful to manage the files: drag and drop, copy-paste, delete, open, rename, etc. Task manager, just like “ps aux” and “top”, allows us to see the CPU usage and kill any process. Screensaver or screen lock allows to protect the current screen from others to view, especially when we are away. A popup notification helps a lot to notify the users for a certain matter, e.g. low battery, reminder, email, etc. Screenshot is just useful for some sharing or project. In my opinion, with the components and features stated above, any DE or WM will be satisfying.